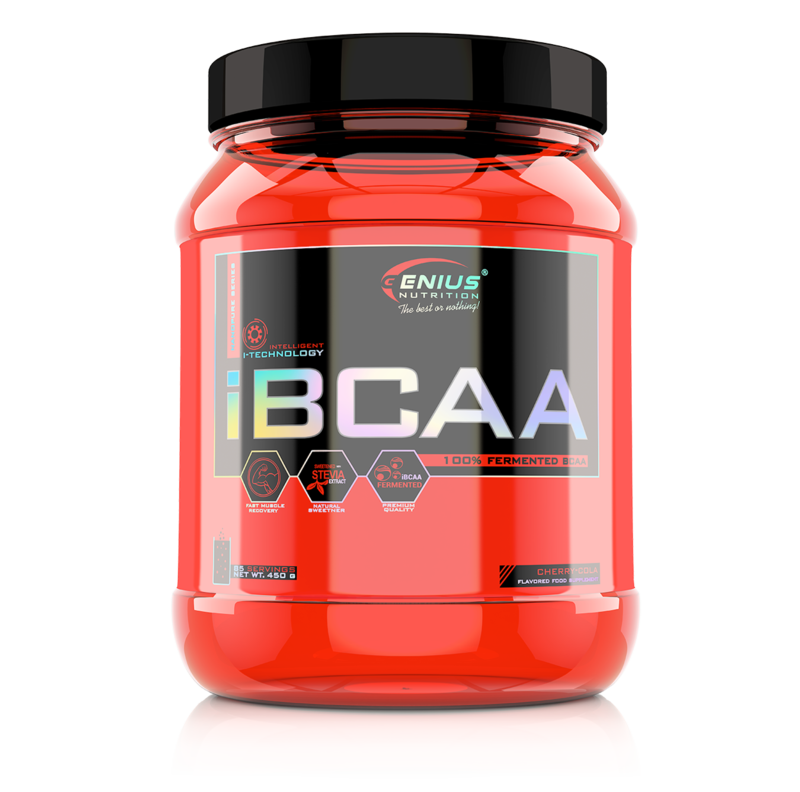 Genius™ Nutrition introduce iBCAA™ the last evolution of purity and quality! iBCAA™ will support your muscles, performance and recover from intense training like never before! The maximum quality means a huge difference on your results, assimilation and effectiveness. iBCAA™ essential amino acids make up about 35 percent of the amino acids in muscle tissue. They are needed to maintain nitrogen balance in our bodies during periods of stress, diets, exercise or injury. It is known that amino acids stimulate potent anabolic effects, effect on performance, increase nitrogen balance and enhance lean body mass without fat. iBCAA™ play an important role since they cannot be produced by the human organism so they need to be provided from an external source, either through diet or supplements. iBCAA™ is 100% from natural fermentation, using only premium raw material. iBCAA™ is manufactured under NanoPure™ System to offer superior and the best final premium quality and results. Did you know that not all BCAA (branched chain amino acids) supplements are created equal? Not from the ratio, or additional ingredient standpoint... but from the actual quality of the aminos themselves. There are several different ways to produce amino acids, and the most common method is a very harsh acid extraction of animal products. This process, which involves hydrolysis for several hours using high heat and strong acids, creates amino acid hydrolysates that must then be filtered, dried, and refined to make them fit for human consumption. This is the most popular way to produce amino acids due to the abundance of raw materials, lower cost and ease of manufacturing. This process may produce a product that is contaminated with allergens and microtoxines. The other, less common, and more expensive method of production of amino acids is accomplished through the fermentation. Through this process, no animal products are used as starting materials; and no harsh chemicals or high heat treatments are used to manufacture the aminos. The result is a higher quality, allergen-free, and more efficacious amino acid product. Genius Nutrition™ proudly uses only fermented aminos, to ensure you are getting the highest quality, while protecting you from contaminants found in lower quality amino acids. 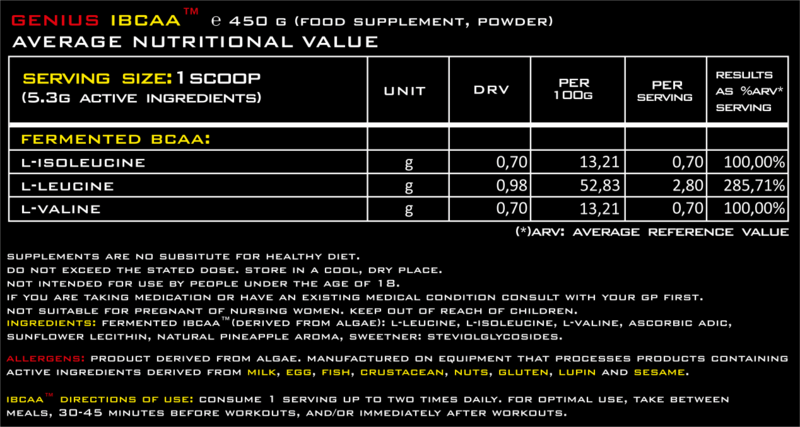 iBCAA™ Directions of use: Consume 1-2 serving up to two times daily. For optimal use, take between meals, 30-45 minutes before workouts, and/or immediately after workouts. Do not exceed recommended dosage.